you know suvs are all the rage when even a supercar brand such as lamborghini has to have one. it's here, and it's the all-new 2019 lamborghini urus: a car named after an ancestor for today's fighting bulls, now on display at the 2018 chicago auto show. typical of lamborghini, the urus has a lot of stuff going on with the face: lots of jagged edges, lots of ventilation. it kind looks like a transformer up front. but all of that ventilation helps feed a twin-turbo 4.0-liter v-8, good for 650 horsepower. the urus does 60 mph in about 3.5 seconds, lamborghini says. 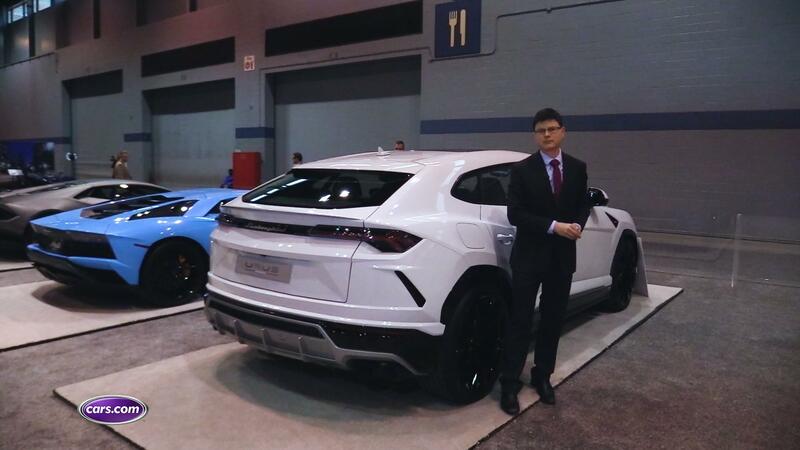 from the side, you can see how long the urus is: about 201 inches. but it's really low because of the fastback roofline, only about 64.5 inches high. compared with other supercar-esque suvs, the bentley bentayga is about as long as the urus but is several inches taller. in the rear, everything just kind of converges on the tail. it's very busy with a lot going on — but it's very lamborghini. inside, you're in a lamborghini, so everything is kind of different in terms of layout versus other suvs. there's a big, t-shaped dashboard that lamborghini says pays tribute to its other supercars as well as its lm002 suv — yes, it had one back in the 1980s. you've got two screens in the urus. the upper screen shows multimedia. apple carplay and android auto are standard, which is nice everyday technology you get in a super suv. the lower screen, meanwhile, has some climate controls. we've seen some new audi models with this two-screen layout, and that makes sense because audi and lamborghini are both brands under the volkswagen group. on the console, you have a lot going on. there's the gear selector and a starter button underneath a red flip cover. to the left of that is the drive mode selector — and it wouldn't be a lamborghini if the modes weren't all labeled in italian: you've got strada, sport, corsa and neve, neve being your snow mode. how much is all of this gonna cost? neve you worry, we have that information: the urus is on sale now and orders are being taken. it starts around $200,000 and goes up from there.